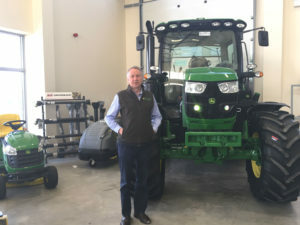 In October 1998, former John Deere employee Colin Smart established Smart Ag Services, supplying agricultural machinery across Dorset, East Devon, and Somerset & Avon. In November 2010, as part of the John Deere “Dealer of Tomorrow” programme, the company joined forces with Ashworth Farm Machinery in Somerset. 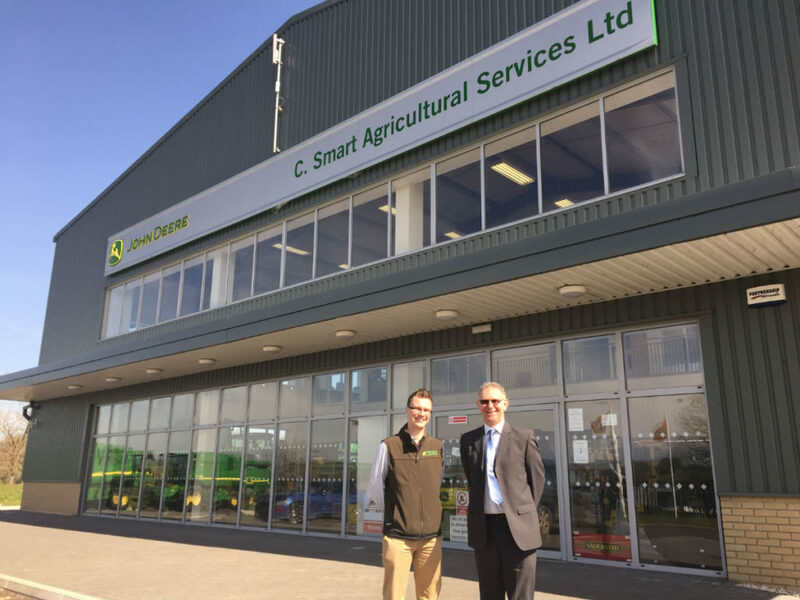 Smart Ag now has depots in Cheddar and Nether Stowey, and as it continues to expand, it continues to cement its reputation as a meticulous, high-calibre agricultural sector service provider. How did you first get involved with the business? Tell us a little about the machinery you sell, the services you provide, and what you do to set yourself apart from other John Deere dealers. 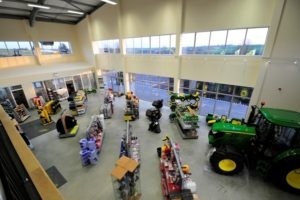 Chris: “We sell all John Deere machinery, from harvesters and balers to foragers and tractors. At the moment we deal mainly with agricultural machinery. The service we provide has always been a hugely important part of the business. Colin always understood that if you make your after-sale service a priority, then sales become much easier. You’ve expanded to serve Dorchester, Cheddar, and Nether Stowey. Can you tell us a little about what has led to that growth? Chris: “When the business was originally set up, we didn’t have a lot of faith in multi-depot dealers, which is why a lot of work went into making sure this location served its territory well, which it did, quite successfully. Previously, technicians came in on Monday morning to collect parts and then for the rest of the week they worked remotely in their own territory. That was how we served the area with one location. When you get to a certain size, however, you realise there is a benefit of scale – you can centralise functions and costs and not double up on certain areas. Using a dealership management system like Gold helps you to do that. Also, there’s a better geographical spread of your engineers, which means you can service the customer a lot quicker and improve your reputation as a dealer. That’s one of the ways we generated organic growth in the market. How do you provide the best possible customer experience? What can someone who has never been in your dealership expect when they encounter you for the first time? How do you feel the agricultural industry has changed in the past 5-10 years? Chris: “The market is currently in a state of flux. 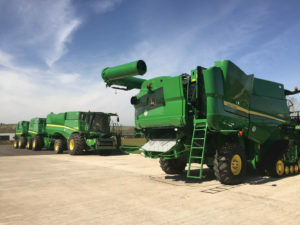 A decline in commodity pricing has resulted in uncertainty, but people are still buying machinery. What type of dealership management system were you using before Gold? Chris: “We had Gold from the beginning. Colin is not a very technological person, but he understood the benefits of Gold, so as soon as he founded the business, he had it installed. Chris: “I use it constantly, all day, every day, to keep an eye on the profit and loss in the Financial Analysis part of the Wholegoods Sales module. This provides an excellent financial summary from the top down, so at any moment in time, you know exactly where you stand. This is critical in helping us plan and prepare for the future. I would imagine Colin mainly uses the Wholegoods module, specifically the Document Management System, to manage inventory and deals, and all the business paperwork. Gold stores all of our emails and attachments, so that we can access everything at any moment. The Wholegoods Document Management System also helps us meet the requirements of John Deere’s incentives program. We try to make sure our team emails all documents directly to the Wholegoods module so that all the files are in one place. For example, our technicians will email photographs to Gold as evidence gathering for warranty purposes. Since warranties tend to fluctuate, we now need images of everything and the Document Management module has helped us stay organised. What we try to do as a business is to make people responsible. We believe in a flat line management style with no hierarchical system. We try to make everyone feel responsible for their part of the business and we make sure to input everything into Gold. This way, we spend less time chasing and tidying up Gold and more time managing the business. Gold definitely helps us spend our time more productively. What was your experience like with the Ibcos implementation process? What kind of advice would you give to other dealers who are looking to grow their business and reach their objectives?